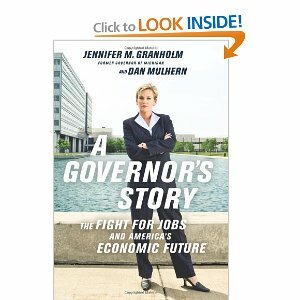 Tomorrow, Jennifer and I officially release A Governor’s Story: The Fight for Jobs and America’s Economic Future. It took us about 18 months to write, and it’s about 300 pages long, so, (how) can I distill a decent Reading for Leading message? (Warning: I run a paragraph longer than usual, but beg you to reach the end and hit the “comment” button.) The book focuses on the massive change in our economy brought on by the one-two punch of global trade and phenomenal technological breakthroughs that have KO’ed thousands of American workers in manufacturing and many other fields as well. We have outlined what we believe are new and important ways that America can adjust to meet its challenges. But RFL has never been about political economy and won’t be today. Instead: a thought on modern, human leadership. It’s a mixed bag. Jennifer didn’t want to write puffery – a leader-knows-it-all book. It wouldn’t have been credible. She presided over the government while the Michigan economy was going through its worst period since the Great Depression. I encouraged, at times cajoled her/us to tell the inner story. That wasn’t easy. Like many great (extrovert) leaders, she’s an “outer story” person. Unlike “it’s all about me – me,” she’s all about others – like the 2700 workers in Greenville, whose jobs were moved to Mexico overnight. But in the book, Jennifer gives a peek into her own heavy-lifting. As governor, she’d periodically startle me out of sleep, as she exhaled like a weight-lifter emitting bursts of air through pursed lips. I imagined that in her dreams she was straining to pull 10 million people up the hill that stood before Michigan. I came to see that she was also pulling the weight of her own battered identity. Just as factory workers were accustomed to fairly ready access to good paying work, Jennifer had been accustomed to outworking everyone and securing awesome results. This time, the results that mattered just didn’t come. The book begs the question I ask of you: Should a leader tell? Tell that he’s not sure. Tell that she’s struggling, too. Tell people that (although she has a plan) she’s no more got a magic wand in her hand than the dumped workers at Electrolux had one in theirs? On the big scale such self-disclosure exposes a leader to accusations of weakness, if not to scorn. FDR, one of our heroes, remains an idol, in part because he never let the public see his crutches, and told us “there’s nothing to fear…” Jennifer led with that type of insistent confidence; it was not feigned but real. Yet, as Kouzes & Posner write, “leaders go first,” by which they mean that leaders show vulnerability, admit ignorance, and invite others to tell the truth, and lead themselves. I know on the personal scale of leadership we want bosses, priests, managers, etc., who are adults and who relate to us as adults, not like old-fashioned parents who pretend that they know all and only do good.